The Blood Pressure Lowering Treatment Trialists Collaboration (BPLTTC) was initiated in 1995 as a collaboration between the Principal Investigators of all the major ongoing clinical trials of blood pressure-lowering agents at the time. The first cycle of analyses included 15 trials and over 74,000 individuals. There 14 trials that were added in the second cycle, which included over 162,000 individual participants in total. These phases in the collaboration were successful in providing reliable evidence for the benefits of blood pressure-lowering for the prevention of major cardiovascular outcomes. 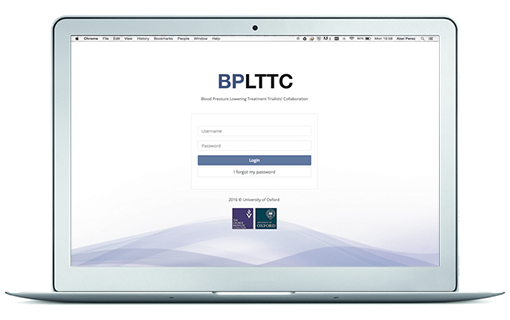 In 2014, the BPLTTC was extended and new trialists were invited to join the collaboration. The third and current phase of the collaboration now includes over 350,000 individuals from 50 trials. This resource offers an unprecedented opportunity to clarify uncertainties in blood pressure lowering treatment and provide clinically relevant findings in specific patient subgroups. The current cycle of the BPLTTC is coordinated by The George Institute for Global Health UK at Oxford University. Its work is governed by a Steering Committee consisting of select Principal Investigators of some of the largest trials included in the BPLTTC and chaired by Kazem Rahimi, Deputy Director of The George Institute UK. The Steering Committee is responsible for general oversight of the BPLTTC and providing scientific leadership regarding all aspects of proposal development, analysis, interpretation and reporting. A wide network of collaborators contributes to all scientific activities and debates. The BPLTTC was initially supported by grants from the pharmaceutical industry, including Astra Hassle AB, Bayer AG, Bristol-Myers Squibb Company, Glaxo Wellcome, Hoechst Marion Roussel, Knoll AG, Merck and Company, Pfizer Inc., Searle and Institut de Recherches Internationales Servier, as well as the British Heart Foundation. Since 2005, BPLTTC has not been funded by the pharmaceutical industry and has only been supported by peer reviewed sources, such as the National Health and Medical Research Council of Australia and the UK National Institute for Health Research. In October 2018, the BPLTTC was awarded over £150,000 from the British Heart Foundation to investigate the stratified efficacy and safety of pharmacological blood pressure-lowering. The largest tabular meta-analysis of blood pressure-lowering trials has recently suggested similar proportional benefits of blood pressure-lowering at different baseline trial-level blood pressure for a range of cardiovascular outcomes, but it is unclear if the benefits are consistently observed across patient subgroups. Furthermore, tabular meta-analyses are unable stratify by baseline blood pressure at an individual level and to control for competing events. A detailed individual patient data meta-analysis will provide a more in-depth examination of blood pressure-lowering at different baseline levels, the impact on blood pressure changes, and the different proportional effects on major cardiovascular outcomes (coronary heart disease, stroke and heart failure). This approach will also help ascertain whether or not certain drug classes have particularly strong beneficial or adverse effects in specific patient subgroups. Currently, there is limited or conflicting evidence about the effect of blood pressure-lowering on outcomes such as dementia, renal failure, cancer, falls, fractures and other serious adverse events. Some blood pressure-lowering trials have reported that more intensive blood pressure treatment is associated with a higher risk of serious adverse events compared with less intensive regimens. However, this association has not been investigated in detail across the whole spectrum of baseline blood pressures levels or in different patient subgroups. This project will classify serious adverse events across different trials and investigate the unintended consequences of blood pressure-lowering stratified by important patient characteristics. Previous studies of effects of different classes of blood pressure-lowering drugs on risk of diabetes have reported contradictory findings. Some have reported that beta-blockers and thiazide diuretics increased the risk, while renin-angiotensin system inhibitors decreased the risk of diabetes. However, limited sample size of studies based on an individual trial may make their findings unreliable. In this project, we aim to provide robust evidence on the effect of blood pressure-lowering drugs overall and by drug classes on risk of incident diabetes. Atrial fibrillation (AF) is the most common clinically significant cardiac arrhythmia and its incidence and prevalence are on the rise across the globe, fuelled by population ageing and other cardiometabolic risk factors. AF is associated with an increased risk of fatal and nonfatal cardiovascular events, particularly stroke. Although hypertension doubles the risk of developing AF, there is uncertainty around whether antihypertensive treatment can effectively reduce the risk of AF. This project aims to understand the effects of antihypertensive drugs on new-onset and recurrent AF. Hypertension is also very common in patients with AF. However, evidence demonstrating the impact of blood pressure-lowering treatment in patients with AF on cardiovascular events remains limited. Therefore, this project will also compare the effects of antihypertensive treatment in patients with and without AF at baseline. Multimorbidity, defined as the presence of two or more diseases in the same patient, is a growing epidemic worldwide and it is also increasingly common in patients with cardiovascular disease. However, such patients have been typically excluded or underrepresented in clinical studies, and hence the balance of harms and benefits of blood pressure-lowering treatment in patients with multiple comorbidities remains poorly understood. Therefore, this project aims to investigate whether the efficacy and safety of antihypertensive treatment varies by number and ‘clusters’ of baseline comorbidities. Combining the large number of trials included in BPLTTC will allow overcoming the lack of power of individual trials to perform multiple subgroup analyses. Some observational analyses have suggested that initiation of blood pressure lowering therapy is associated with an increased risk of fractures. However, these analyses are susceptible to confounding (sicker elderly patients being initiated on BP lowering medication). In contrast, an analysis of HYVET indicated that BP lowering in the elderly reduced the rate of fractures. An IPD meta-analysis will investigate the long-term effect of antihypertensive therapy on falls/fractures in more detail. With > 350,000 patients included in the collaboration, the BPLTTC is the largest single data resource of individual patient-level randomized clinical trial data. J Hypertens 2019, 37(1)16-23. doi: 10.1097/HJH.0000000000001994. Effects of blood pressure lowering on cardiovascular risk according to baseline body-mass index: a meta-analysis of randomised trials. Blood Pressure Lowering Treatment Trialists' Collaboration., Ying A, Arima H, Czernichow S, Woodward M, Huxley R, Turnbull F, Perkovic V, Neal B.
Lancet. 2015 Mar 7;385(9971):867-74. doi: 10.1016/S0140-6736(14)61171-5. Blood pressure-lowering treatment based on cardiovascular risk: a meta-analysis of individual patient data. Blood Pressure Lowering Treatment Trialists' Collaboration., Sundström J, Arima H, Woodward M, Jackson R, Karmali K, Lloyd-Jones D, Baigent C, Emberson J, Rahimi K, MacMahon S, Patel A, Perkovic V, Turnbull F, Neal B.
Lancet. 2014 Aug 16;384(9943):591-8. doi: 10.1016/S0140-6736(14)61212-5. Authors' reply to Ladapo and Ogedegbe. Ninomiya T, Perkovic V; Blood Pressure Lowering Treatment Trialists’ Collaboration. BMJ. 2014 Jan 15;348:g148. doi: 10.1136/bmj.g148. No abstract available. Blood pressure lowering and major cardiovascular events in people with and without chronic kidney disease: meta-analysis of randomised controlled trials. Blood Pressure Lowering Treatment Trialists' Collaboration., Ninomiya T, Perkovic V, Turnbull F, Neal B, Barzi F, Cass A, Baigent C, Chalmers J, Li N, Woodward M, MacMahon S.
BMJ. 2013 Oct 3;347:f5680. doi: 10.1136/bmj.f5680. Review. The effects of blood pressure reduction and of different blood pressure-lowering regimens on major cardiovascular events according to baseline blood pressure: meta-analysis of randomized trials. Czernichow S, Zanchetti A, Turnbull F, Barzi F, Ninomiya T, Kengne AP, Lambers Heerspink HJ, Perkovic V, Huxley R, Arima H, Patel A, Chalmers J, Woodward M, MacMahon S, Neal B; Blood Pressure Lowering Treatment Trialists' Collaboration. J Hypertens. 2011 Jan;29(1):4-16. doi: 10.1097/HJH.0b013e32834000be. Management of hypertension: evidence from the Blood Pressure Lowering Treatment Trialists' Collaboration and from major clinical trials. Pol Arch Med Wewn. 2009 Jun;119(6):373-80. Review. Do men and women respond differently to blood pressure-lowering treatment? Results of prospectively designed overviews of randomized trials. Turnbull F, Woodward M, Neal B, Barzi F, Ninomiya T, Chalmers J, Perkovic V, Li N, MacMahon S; Blood Pressure Lowering Treatment Trialists' Collaboration. Eur Heart J. 2008 Nov;29(21):2669-80. doi: 10.1093/eurheartj/ehn427. Epub 2008 Oct 13. Review. Effects of different regimens to lower blood pressure on major cardiovascular events in older and younger adults: meta-analysis of randomised trials. Blood Pressure Lowering Treatment Trialists' Collaboration., Turnbull F, Neal B, Ninomiya T, Algert C, Arima H, Barzi F, Bulpitt C, Chalmers J, Fagard R, Gleason A, Heritier S, Li N, Perkovic V, Woodward M, MacMahon S.
BMJ. 2008 May 17;336(7653):1121-3. doi: 10.1136/bmj.39548.738368.BE. Epub 2008 May 14. Review. Blood pressure-dependent and independent effects of agents that inhibit the renin-angiotensin system. Blood Pressure Lowering Treatment Trialists' Collaboration., Turnbull F, Neal B, Pfeffer M, Kostis J, Algert C, Woodward M, Chalmers J, Zanchetti A, MacMahon S.
J Hypertens. 2007 May;25(5):951-8. Erratum in: J Hypertens. 2007 Jul;25(7):1524. Effects of different blood pressure-lowering regimens on major cardiovascular events in individuals with and without diabetes mellitus: results of prospectively designed overviews of randomized trials. Turnbull F, Neal B, Algert C, Chalmers J, Chapman N, Cutler J, Woodward M, MacMahon S; Blood Pressure Lowering Treatment Trialists' Collaboration. Arch Intern Med. 2005 Jun 27;165(12):1410-9. Effects of different blood-pressure-lowering regimens on major cardiovascular events: results of prospectively-designed overviews of randomised trials. Turnbull F; Blood Pressure Lowering Treatment Trialists' Collaboration. Effects of ACE inhibitors, calcium antagonists, and other blood-pressure-lowering drugs: results of prospectively designed overviews of randomised trials. Blood Pressure Lowering Treatment Trialists' Collaboration. Neal B, MacMahon S, Chapman N; Blood Pressure Lowering Treatment Trialists' Collaboration. The World Health Organization--International Society of Hypertension Blood Pressure Lowering Treatment Trialists' Collaboration: prospective collaborative overviews of major randomized trials of blood pressure-lowering treatments. Curr Hypertens Rep. 1999 Aug;1(4):346-56. An overview of 37 randomised trials of blood pressure lowering agents among 270,000 individuals. World Health Organization-International Society of Hypertension Blood Pressure Lowering Treatment Trialists' Collaboration. Clin Exp Hypertens. 1999 Jul-Aug;21(5-6):517-29. Protocol for prospective collaborative overviews of major randomized trials of blood-pressure-lowering treatments. World Health Organization-International Society of Hypertension Blood Pressure Lowering Treatment Trialists' Collaboration. Copyright © 2019 The George Institute for Global Health. All Right Reserved.